Norway is a country of wild beauty. Deep blue fjords, thundering waterfalls and towering mountains with snow-capped peaks. The elements carved the contours of this country with a heavy hand. Continental collisions created the mountain ranges that cover about two-thirds of the country, while powerful glaciers and rivers created the deep fjords, gorges and canyons. And those same glaciers in concert with the stormy seas etched the jagged western coastline. Because it has so much natural beauty, the best way to experience Norway is to be outside, in nature. And one of the most beautiful areas to explore is southwestern Norway, along the Atlantic coast. Renting a car will allow you to enjoy the breathtaking countryside and National Tourist Routes as you do a loop of western Norway. Plus, it gives you the freedom to stop and visit smaller towns and off-the-beaten-path destinations. Start your trip in Bergen. Known as the Gateway to the Fjords, Bergen is Norway’s second-largest city. 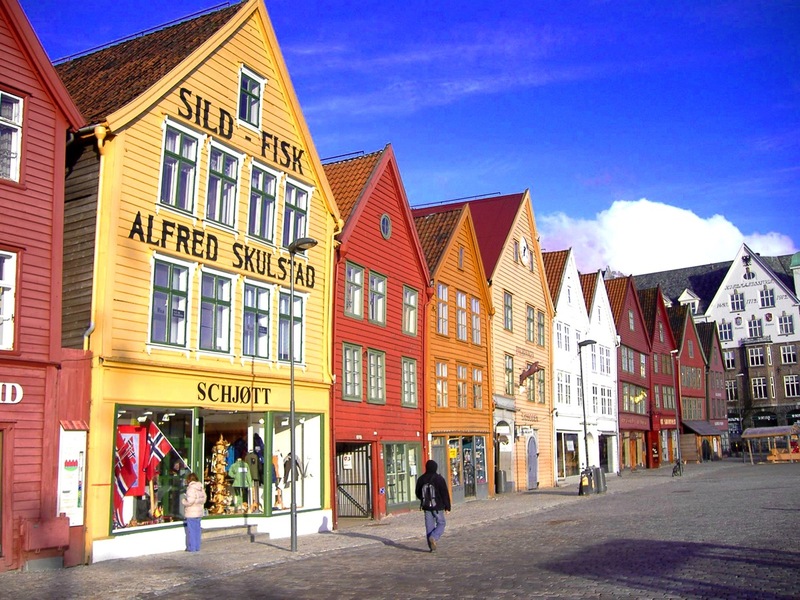 Located on the southwestern coast, Bergen is surrounded by seven mountains. It’s a charming city in its own right, in addition to an ideal starting spot to explore some of Norway’s most beautiful attractions. Visit Bryggen, the remains of the medieval wharf in the historic harbour district, which is a designated UNESCO World Heritage Site. Bryggen features colorful, wooden boathouses now converted into shops, restaurants and bars. To enjoy panoramic views of the city, take a ride on the Fløibanen, the funicular that takes you up to the top of Mount Fløyen. Look for the Fløyenguttene, Kashmir goats that trim the grass on the mountain. Hike the scenic trail between Mount Fløyen and Mount Ulriken, then take the Ulriken Cable Car back down into Bergen when you’re finished. Where to Eat: Grab a bite to eat at the fish market, which features fresh local fish and more unusual delicacies, such as whale and seal. Trolltunga, or the Troll’s Tongue, is a rocky slab of granite that juts out over Lake Ringedalsvatnet, which sits far below. It’s a long, strenuous hike to reach it—roughly 13 miles round trip—but the views are well worth it. Hike through high mountains, past lakes, rivers and waterfalls, with snowy mountain peaks in the distance. Then pose for pictures and enjoy the breathtaking scenery from the perch overlooking the lake. Guided hikes are also available, if you would prefer. Where to Eat: Grab food and water at the supermarket in Odda to bring with you so you can enjoy a picnic during the hike. 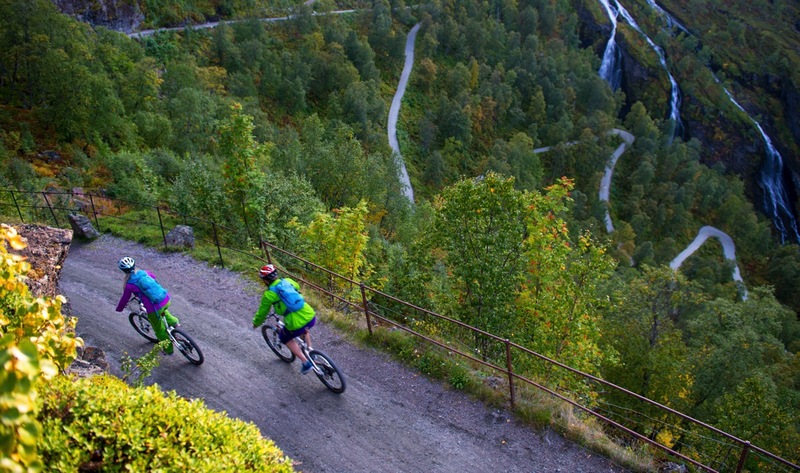 Enjoy a mountain bike adventure on Rallarvegen, or the navvy road, which was originally an access road for the navvies—or railway construction workers—and which is now a popular bike trail and designated cultural monument. You can cycle the whole road or just do a portion. The most popular section is the stretch from Finse to Flåm. Starting in Finse, you’ll have views of Hardangerjøkulen glacier. Cycle up to Fagernut, which is the highest point of the Rallarvegen at about 4,400 feet above sea level. Then continue down to Flåm, which sits at the end of Aurlandsfjord. Along the way, you’ll pass through beautiful mountainscape, with lush forests, roaring waterfalls and rivers. Drop off your bikes in Flåm and explore the quaint village on foot. Grab a bite to eat, do some shopping and enjoy the harbor. Then take a ride on the beautiful old Flåm railway. While the Flåmsbana is one of the steepest railway lines in the world, it’s also been named one of the most beautiful train journeys in the world. You’ll be retracing some of the route that you took on bike, but this time, you can relax and enjoy the scenery from the comfort of a beautiful train car. The train stops at a few especially scenic spots so you can take pictures. See if you can catch a glimpse of the huldra, seductive creatures said to lure people into the forest with their enchanting songs. Where to Eat: Located in a building that resembles a stave church, Aegir BrewPub brews their own award-winning beer, makes their own aquavit—a distilled spirit flavored with herbs—and serves food inspired by Viking history and made with local ingredients. 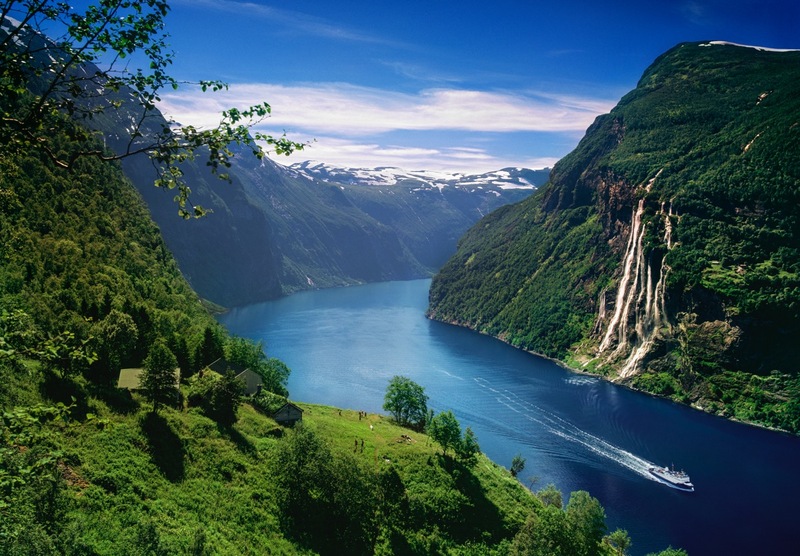 A UNESCO World Heritage Site, Geirangerfjord is quintessential Norway. Steep mountains covered in lush green forests frame deep blue water. Waterfalls cascade down the side of the cliffs to the fjord far below. When the weather is calm, the water is still as glass, reflecting the sky above and the mountains surrounding it. Hiking trails snake up the sides of the cliffs, offering great views of the fjord from above. One popular hike leads to Skageflå, an abandoned hillside farm on the edge of a cliff overlooking the fjord. Catch a boat to the start of the trail, which is a steep climb up the side of the cliff. Once you reach the clearing, where the farm is perched, you’ll enjoy spectacular panoramic views of the fjord and the waterfalls across the way, known as the Seven Sisters. The trail continues up for a bit, as you wind your way through the forest, and then you’ll make your way back down the other side and into Geiranger, the quaint little village that sits at the head of the fjord. Another great way to experience the fjord is by boat. Try the rib boat tour for an exhilarating, high-speed adventure, or try a sightseeing boat for a more leisurely pace. You can also rent kayaks to explore the fjord on your own. Where to Eat: Stop in at the Geiranger Bakeri for coffee and skoleboller, or school buns. These popular yeast buns are made with vanilla custard and sweetened coconut flakes. 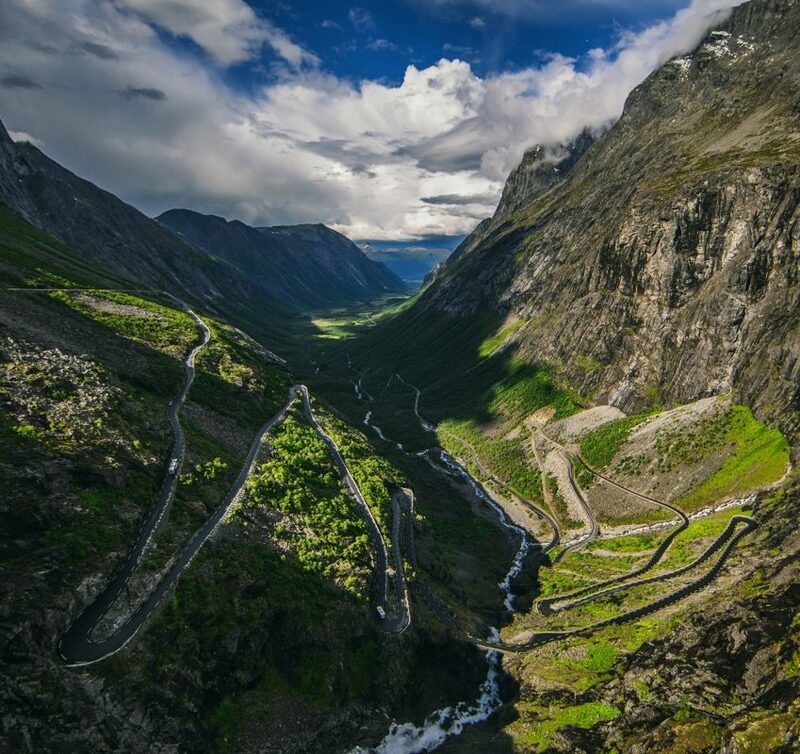 Trollstigen, or the Troll’s Road, is perhaps the most famous stretch of road in Norway. This National Tourist Route takes you from Geiranger to the bottom of Romsdal valley. The hairpin turns, the steep cliffs and the waterfalls make this one of the most unique driving experiences ever. Some might call it terrifying! Don’t miss the Trollstigen Center where you can get a coffee, shop for souvenirs and walk to a few scenic viewpoints for pictures before you start the drive. 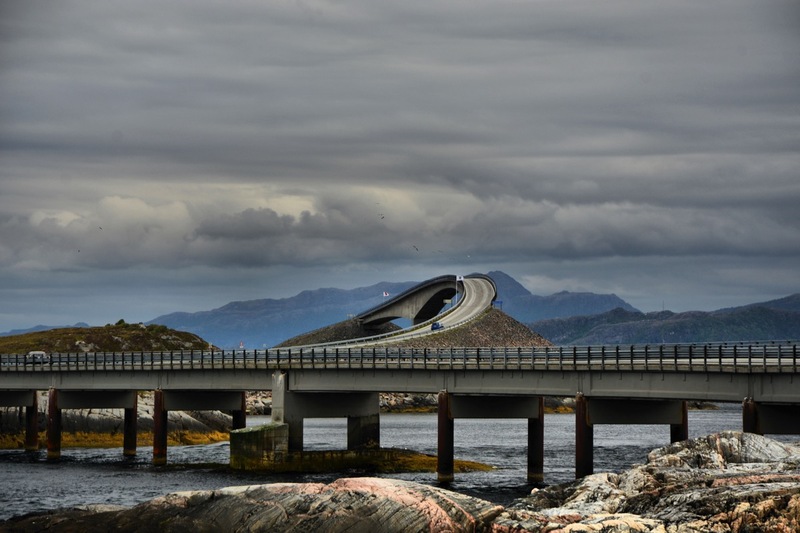 The Atlantic Road consists of eight bridges that span a series of small islands along the western coast. Like Trollstigen, it is a designated National Tourist Route, and it’s been called the world’s most beautiful drive. The road soars and twists like a ribbon as it crosses the ocean, while the waves crash below. Stop at the designated viewing areas to enjoy the scenery. Once you’ve finished driving The Atlantic Road, take a leisurely drive back down the coast to Bergen, stopping off at small towns along the way and soaking up the scenery. 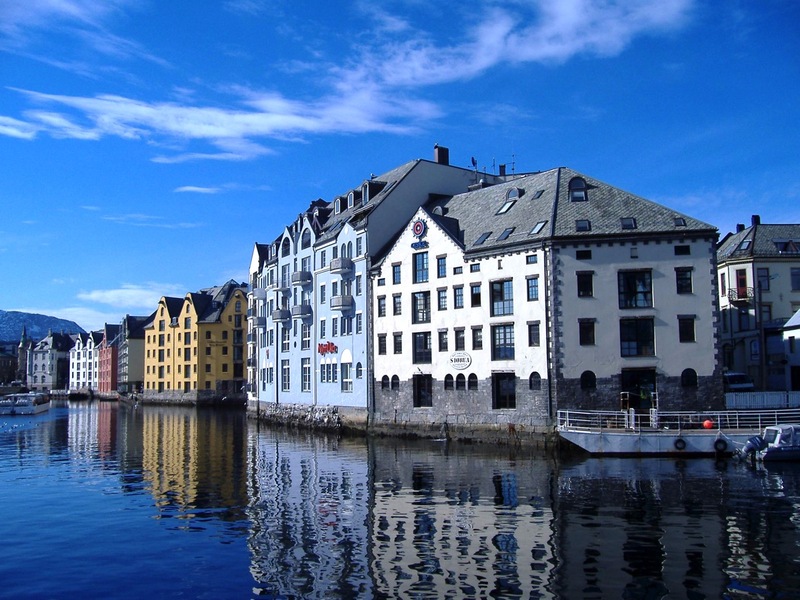 You may want to break up your drive with a stay in Ålesund, a picturesque town on the water, famous for its Art Nouveau architecture. Rent kayaks and kayak through the canals of the city and then out to the ocean. After that, walk up the 418 steps to the viewpoint at Aksla, which overlooks the city and offers views of the surrounding islands as well as the ocean. When planning your trip, don’t miss the fabled midnight sun and great weather during the summer months of June–August. To avoid larger throngs of tourists, consider traveling during the off-season, in the early fall or late spring. 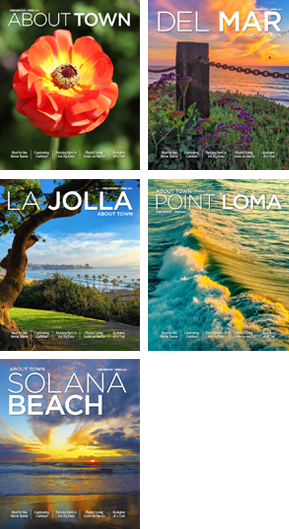 There are non-stop flights between Los Angeles (LAX) and Oslo (OSL) on Norwegian Air that are reasonably priced. From Oslo, you can rent a car and drive into Bergen. You can also fly in and out of Bergen (BGO), but these are not non-stop and may include a connecting flight. Regardless of how you get there, rugged beauty and adventure await in fabled and fun Norway! Jubel!